Predicting Pesticide Levels in Streams and Rivers--Where is Water Quality at Risk? 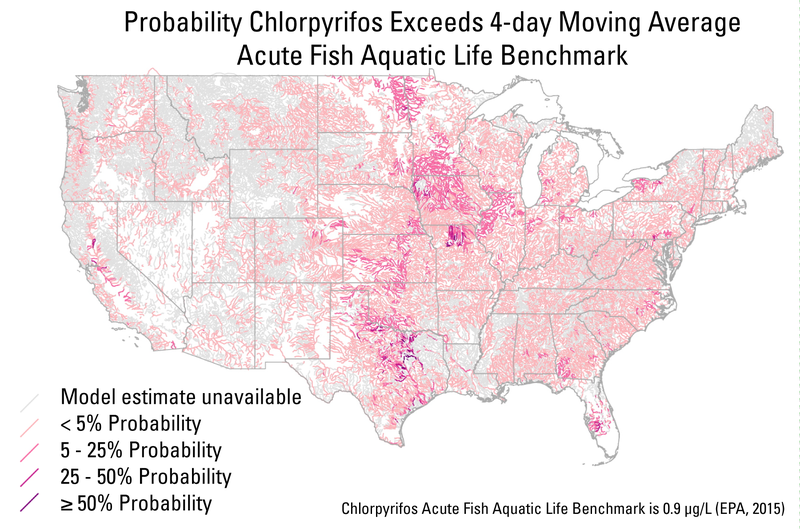 Chlorpyrifos is an insecticide used commonly on cotton, corn, citrus, and almond crops. 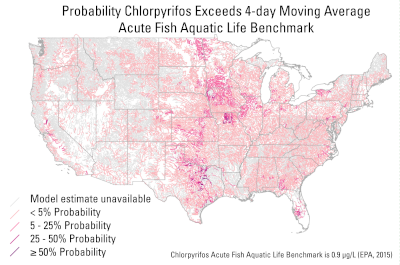 In 2012, streams in the Midwest, central Texas, southwest Florida, and the Central Valley in California were predicted to have chlorpyrifos levels with a greater likelihood of exceeding the acute fish aquatic life benchmark. Users of the mapping tool can view the spatial variability of more than 100 pesticides. Image Credit: USGS. A new interactive mapping tool predicts likely concentrations for 108 pesticides in streams and rivers across the Nation. identify which streams and rivers are most likely to exceed water-quality guidelines for human health or aquatic life. Water-resource managers, environmental professionals, and others can use this information to design cost-effective pesticide monitoring programs and evaluate ecological risks for pesticides. The online mapping tool is based on a U.S. Geological Survey (USGS) statistical model—referred to as Watershed Regression for Pesticides (WARP)—which estimates concentrations using information on the physical and chemical properties of pesticides, agricultural pesticide use, soil characteristics, hydrology, and climate. Model estimates are based on pesticide-monitoring data collected since 1992 as part of the USGS National Water-Quality Assessment (NAWQA) Program. The NAWQA Program provides nationally consistent data and models to address where, when, and why the Nation's water quality is degraded and what can be done to improve it for human and ecosystem needs. The USGS NAWQA Program provided the funds to develop the online mapping tool. Ryberg, K.R., and Gilliom, R.J., 2015, Trends in pesticide concentrations and use for major rivers of the United States: Science of the Total Environment, v. 538, p. 431–444, doi:10.1016/j.scitotenv.2015.06.095.